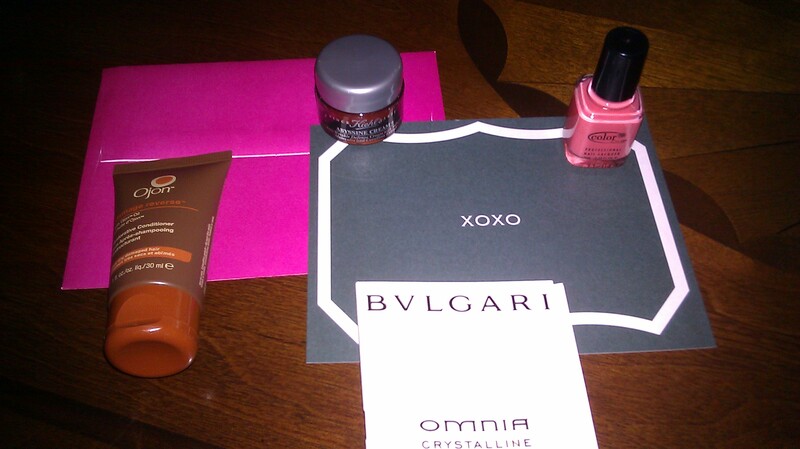 I’m loving Birchbox’s themes lately. 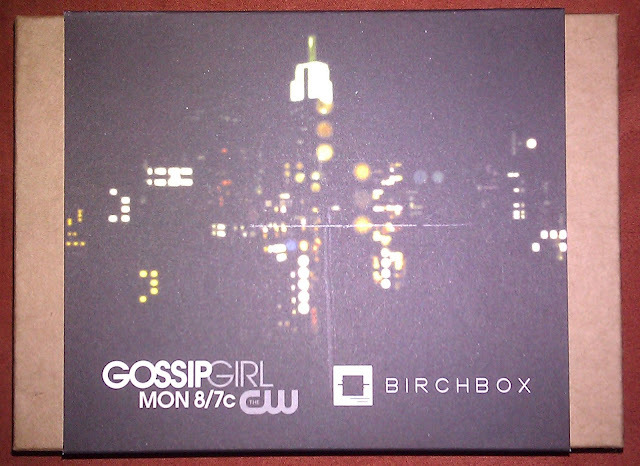 This month’s theme is Gossip Girl which is a show I watch regularly, even though I detest Serena Van Der Woodson. I don’t think this box will necessarily turn me into an Upper Eastsider but I am having a good time playing with the products just the same. If you are not yet familiar with BirchBox, it’s a monthly beauty subscription service that is just $10 a month and you can cancel at anytime with no penalty. Based on a beauty profile that you fill out upon subscription, you will receive 4-5 deluxe beauty products a month. Sign up yourself or get more info at Birchbox.com. BVLGARI Omnia Crystalline Eau de Toilette Spray-This scent is inspired by luminescent crystals and has notes of lotus flowers, bamboo, and Nashi pear. This combo sounds like a good idea but I didn’t care for it. Color Club Nail Polish in Clambake Coral-I think this nail polish is supposed to invoke thoughts of summers in the Hamptons (not that I know what that’s like) but it just reminds me of a hot mess because that’s what my toes look like. This polish is very matte and it came out very clumpy and in uneven streaks. Then I put a glitter polish on top to disguise the imperfections, let’s just say that was a bad idea. Kiehl’s Abyssine Cream-This is an anti-aging moisturizer that uses microscopic Abyssine molecules to soften wrinkles and protect skin from radical damage. I’ve been slathering this on the last few nights, it’s nice and thick. Ojon Damage Reverse Restorative Conditioner-This deep conditioner has exotic ojon and monoi oils in it to smooth and hydrate damaged hair. I have been wanting to try Ojon for a long time and will be posting a review once I give it a test run. 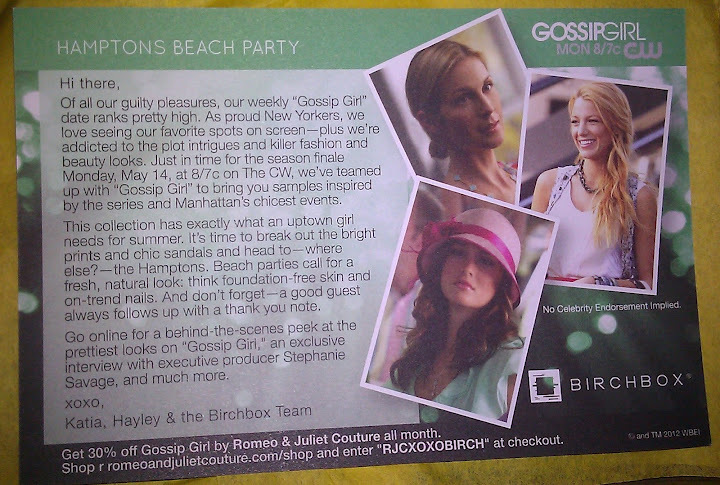 My Birchbox extra was cute little notecard with XOXO printed on it and a hot pink envelope. I got the Stila eye liner in mine 🙂 actually mine was all different 🙂 hehe anyways it’s always fun to see what other people got! stop by my blog! I have a giveaway going on too! Thanks I’ll check your blog out! I am glad to see I wasn’t the only one that had issues with this polish, it took me at least 3 coats to get it looking somewhat okay but I still have a lot of streaks with it. I’m glad I wasn’t the only one either. I’m going to remove it this weekend my toes look like crap.